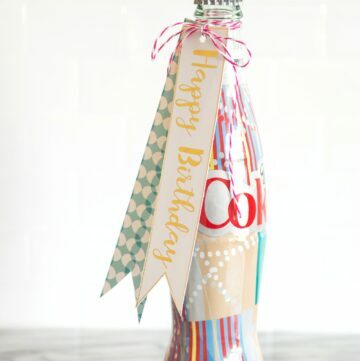 You are here: Home / Crafts / Easy Mother’s Day Gift Ideas & Free Printable Tags & Giveaway! The cute Mother’s Day Gift Ideas are sponsored by Rich Products as a part of their #GiveBakery Campaign. All work, opinions and hair-brained ideas are 100% mine. I think that Mother’s Day might just be the sweetest holiday all year. I remember several years ago, we were flying on Mother’s Day and I was traveling with my twins who were babies at the time. I got to the airport early, anticipating a long trek through security due to the presence of those little babies. I had them in the double stroller with a backpack on my back and a 6 yr old holding onto my one free hand as I approached the security line. As soon as I was in sight of the check in point one of the TSA (I’m not sure it was even the TSA way back then) officers came up to me and said “It’s Mother’s Day, you shouldn’t have to wait in line today.” I was so touched that I almost started crying. The officer brought me and the kids to the front of the line and I was able to get through security quickly and easily. (It’s wasn’t terribly busy that day, otherwise I think the other travelers may have just hated me instead of appreciating the situation). It was on that Mother’s Day that I realized that grand gestures and elaborate gifts are not always the most meaningful. Sometimes it’s the simple gestures of love and thoughtfulness that mean the most to us. 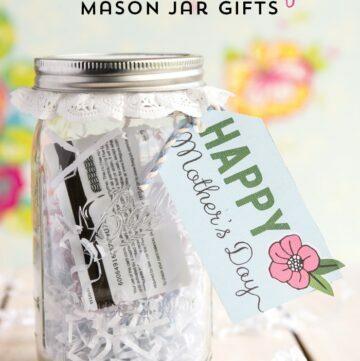 Mother’s Day is fast approaching. I always have grand plans as to what to give to my Mom and Mother-in-Law on Mother’s Day. 9 times out of 10 these plans do not come to fruition. The gifts don’t get sewn and the cookies don’t get baked. I’ve been thinking about what a Mom really wants for Mother’s Day and I think that it’s to hear that her kids love her and remember her. So this year for Mother’s Day I thought I’d help you guys out a bit! 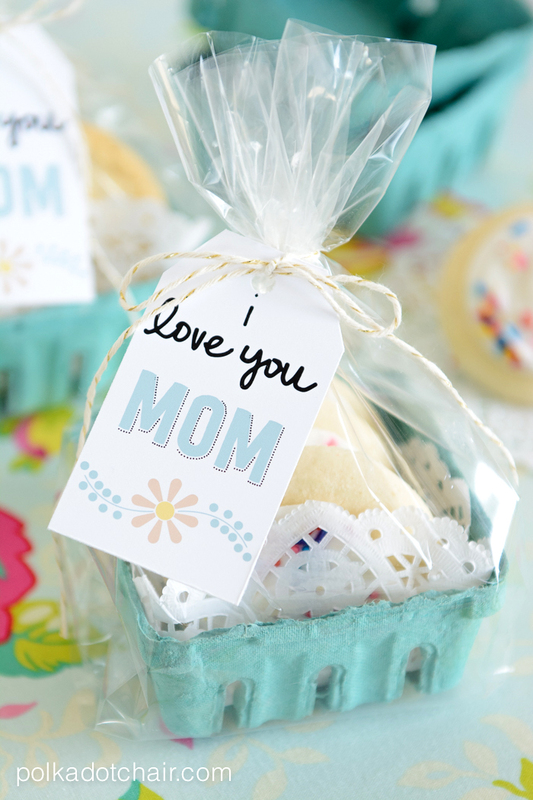 I’ve created these simple “I Love You Mom” tags which are designed to be attached to a sweet treat from the bakery at your local grocery store. Personally I love cookies, all kinds of cookies really but I’m pretty partial to sugar cookies. I picked up a couple of varieties at the grocery store and used some berry boxes and doilies to dress them up a bit. 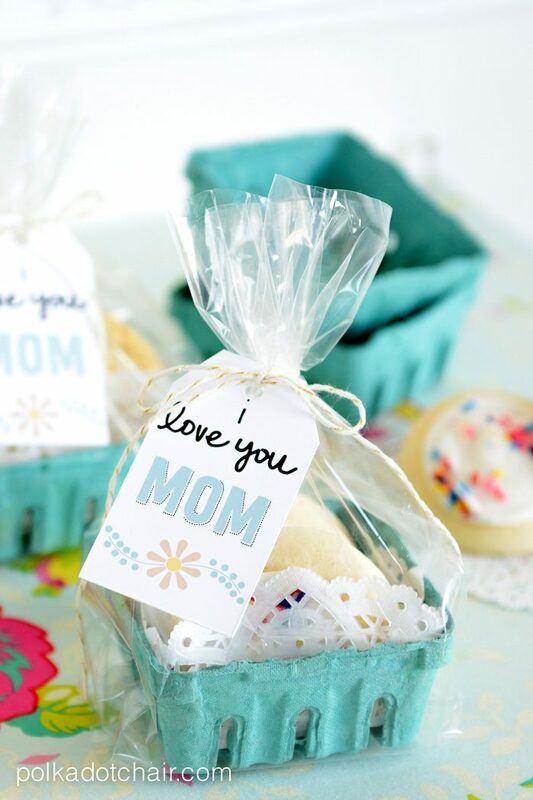 To make this gift, all you need to do is find Mom’s favorite treat at your local bakery, and use a bit of creativity to package it up. 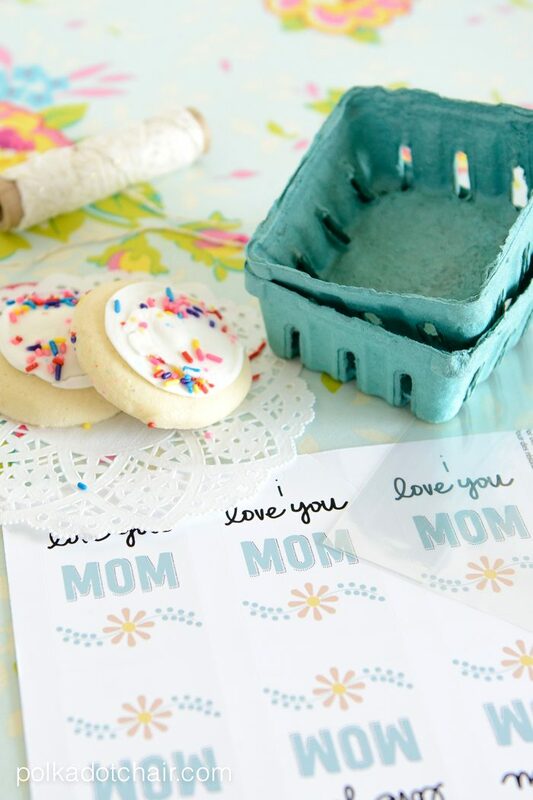 First of all, you need to download and print the “I Love You Mom” tags, you can find them on the Templates page. Make sure you read all of the directions at the top of the page before you download the tags. Next, fold the doily so that it fits in the bottom of the berry basket then arrange the cookies inside. Once you’ve got them looking like you want slip the box into a cellophane bag. 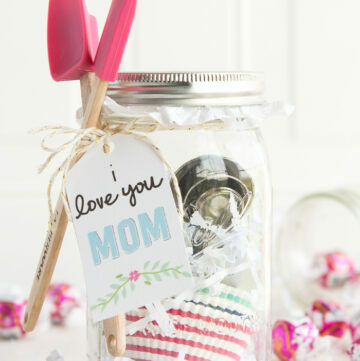 Tie the bag closed with a bit of bakers twine and attach the “I Love You Mom” tags. You should be able to find all of the supplies in the party section at your local store. 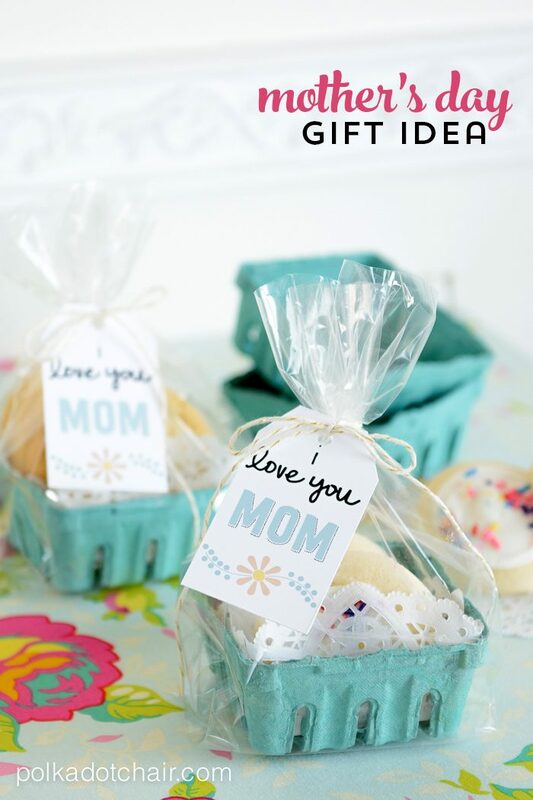 If you’re looking for even more creative ways to package baked goods for Mother’s Day or any other holiday make sure you stop by the Give Bakery Because Pinterest Board. 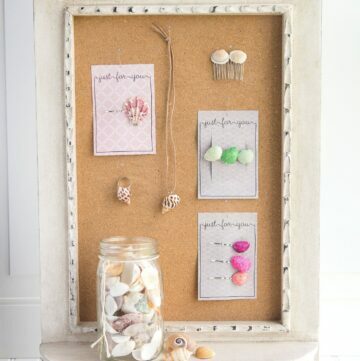 Their boards are full of creative and simple gift ideas from Ideas for Mom to great DIY Packaging Solutions. The Give Bakery Because campaign wants to help you out a bit with your gift giving this Mother’s Day! They are giving away 3 $25 gift card, perfect for purchasing some treats for Mom! 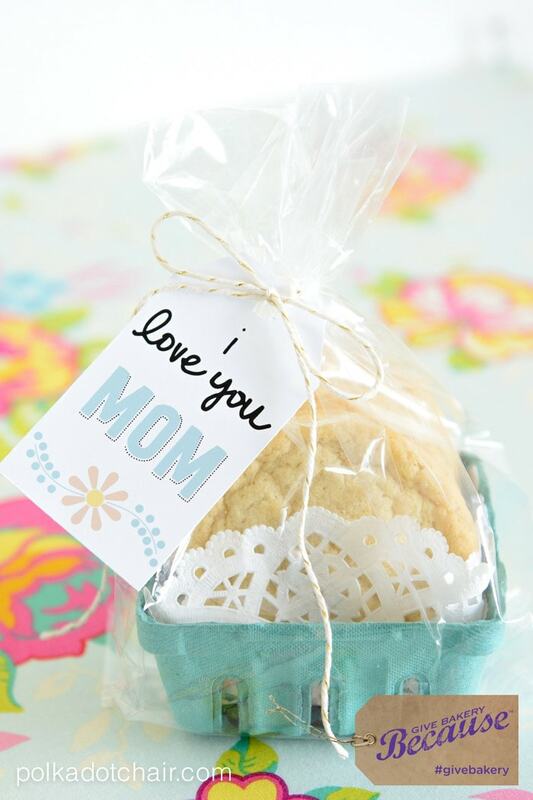 What was the most heartfelt Mother’s Day Gift you’ve ever given or received? Enter using the widget below…. I went back to school at the ripe old age of 44 and took a couple of oil painting classes. As with most new artistic ventures, insecurity is always there: Is it really good? What will people think? etc. The first Mother’s Day after I’d begun painting, my adult son purchased 2 new canvases for me because he believed in me… he liked my work. I found that to be the most encouraging gift ever given. My daughter, now seven, is always trying to be sweet and thoughtful. My robot vacuum broke a couple of years ago when she was five and she immediately went to my husband and secretly told him about her idea of buying me a new one for Mother’s Day. She still to this day talks about how replacing my old vacuum was her idea and is so proud. Makes me so happy to see her gain happiness by being thoughtful! What a sweetie! Last year, my husband organized a BBQ for myself, my mom and his mom. He’s not a big ‘planner’ so that was really great! The most heartfelt Mother’s Day Gift I’ve ever received was a handmade mug from kids. 3 years ago, my husband bought me a Nook Tablet for Mother’s Day and my birthday. I was getting ready to have our 3rd child and he wanted to make sure I would have something to do in my down time. So sweet! The most memorable gift I received for Mother’s Day was a day of relaxation where no one could say, “Hey, Mom…” and they had to help themselves.